About a month ago, my friend Alec reached out to me in a private Facebook message. “I feel like a clot for asking,” he began, “but I figured I would anyway. If you ever hear of any openings at your job…please let me know.” Reading this made me nervous. As it turned out, I had heard of something. That very afternoon, I had written a help wanted ad for an online inventory manager, someone who photographs the cars in stock and writes descriptions for them. I liked this guy and knew he was intelligent, but could I really recommend him as an employee? These situations can be so awkward. What if he got hired and didn’t work out? Would I look bad? What if he didn’t get hired? I was tempted to just tell him no, we didn’t have anything, but I took a chance and shared the ad instead. To my surprise, not only was he an experienced photographer, he’s a camera repairman. Not only is he a good writer, he’s been a car enthusiast his entire life, and Subaru is his favorite brand. So, the day he decided to ask me about a job was the same day I had unknowingly written a posting that fit him perfectly, and within a week, he started his new position without the ad ever hitting the internet. Anyone want to take a stab at figuring the odds of such a sequence? In 2010, I started writing down the coincidences that occurred in my daily life. The only requirement, I decided, was that the coincidence was strong enough to strike me as such, and if it did, I’d write it down. The goal was to document each event without attaching any sort of cosmic significance to it, and then at the end of the year, I’d read the list aloud to anyone who wanted to listen. I find this to be a great way to reflect on years past, and it can be fun to see how the various coincidences interact with one another. Because of this, I’m good at letting go of crackpot theories (usually), but I’ll admit, this one got me thinking: Was Alec’s coincidence just fantastic luck or a reminder of the importance of asking the right questions of the right people? A few people responded. But for the important stuff, the kind that makes me feel the slightest bit vulnerable, I usually just don’t ask. I’m overpowered by feeling like a clot, to borrow Alec’s phrase, and since I don’t, how do I know what I’m missing out on? I’ve got plenty of excuses, but they’re all pretty boring. Mostly just variations on the theme that I don’t want to be a bother. Here we see a universal truth of asking on social media — not all questions are created equal. We all have those people in our news feeds who gamble on the goodwill of their entire network with one appeal after another for this or that. It’s tiresome. Then there’s a personal note from someone real for something real. That’s refreshing. I see professional social media going exactly the same way. People are tiring of being just one of a multitude of followers. The questions to “stimulate engagement” you’ve been told to ask (“what do you think of this beauty?”, etc) are little more than gussied up cattle prods, but since your following is not a herd, they shouldn’t be treated that way. Recently, my wife and I bought a Suzuki SX4 before they were gone, and I posted our delivery photo on Facebook. It turns out that my friend Alan Martin from high school now sells insurance in Kansas City, and with his congratulations, he asked me if we needed help insuring our new vehicle. Coincidentally, I was fed up with my then-current insurance agent, who seemed to always be out of the office when I dropped in, leaving her helpers to answer my questions. In less than 48 hours, I had transferred my business to him. What did I get from my old agent for my fifteen years of business? Nothing. Not a thank you card or even a phone call. Clearly, switching was the right choice. I’m certainly not suggesting anyone start stamping other people’s pictures with unwelcome solicitation, but on the other end of that spectrum, sometimes we’re so afraid of sounding spammy that we miss out on opportunities to contribute value. 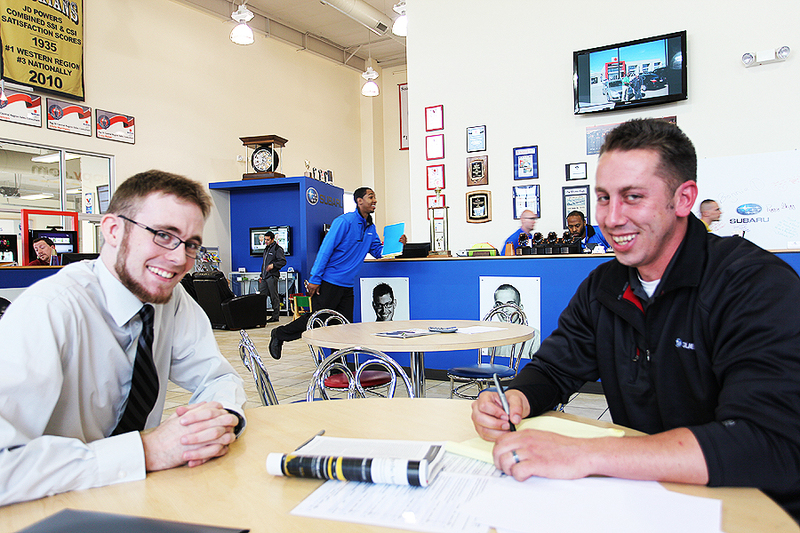 In the car business, we all spend a considerable amount of time at our dealerships, and because of this, it’s easy to let the proceedings of any given day become mundane. It’s also easy to forget that your dealership is a place where lives are changed — not just for your customers, but your coworkers, too. So often, the key to uncover something transcendent from the seemingly banal is just a question away. So, what do you plan on asking today?